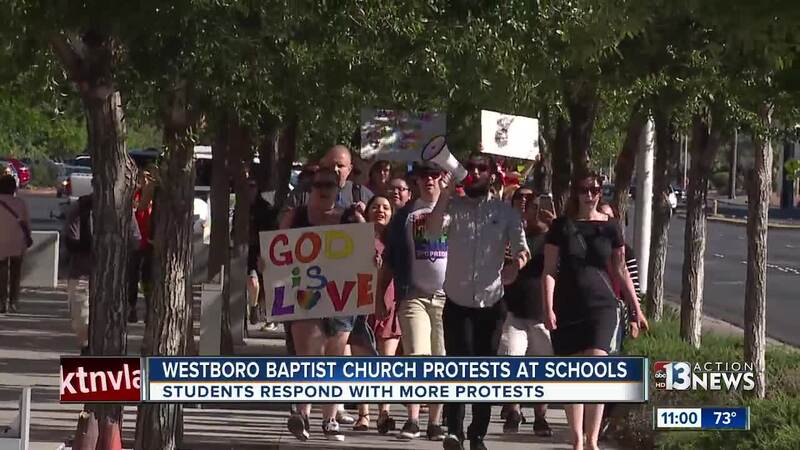 The Westboro Baptist Church protested around the Las Vegas valley Thursday and their first stop was Rancho High School. The group peacefully protested, but the police were present in case things escalated. 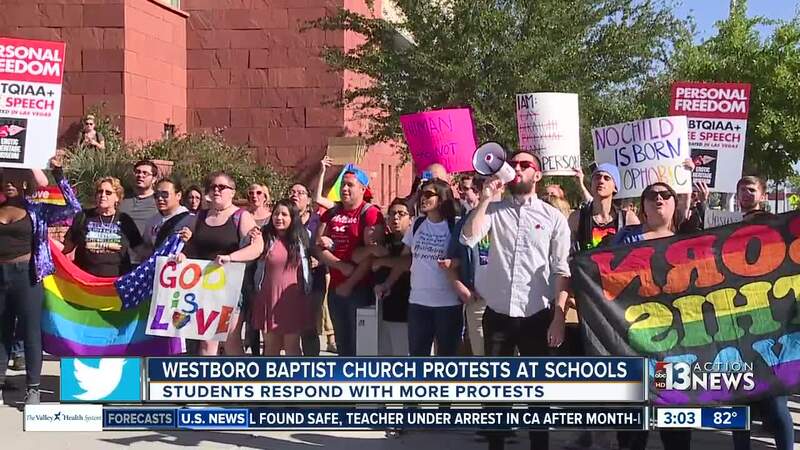 Westboro Baptist Church is located in Kansas and has a history of anti-gay protests at military funerals and public events around the country. 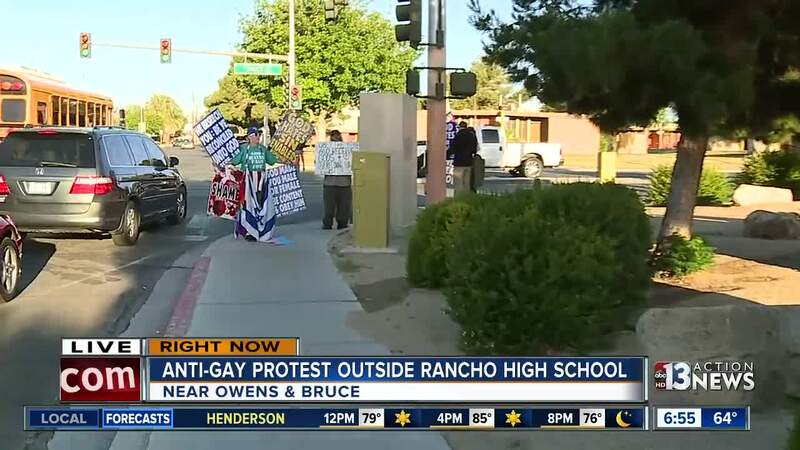 A group of students also gathered outside of Rancho High School around 6:30 a.m. to protest against Westboro Baptist Church. They created signs opposing the groups' beliefs and usage of gay slurs. "I don't think it's right," says 10th grader Anna Irwin. "I don't think any high schooler should have to suffer through that. We need positivity and acceptance on campus, not hate." The Westboro Baptist Church then moved onto the College of Southern Nevada and UNLV. Members of the church said they singled out Rancho High School, trying to spread their message to as many high schoolers as possible. "It's the largest high school in the area," says Shirley Phelps, a member of the Westboro Baptist Church. "It stands for all the high schools." Members called Thursday's protests part of their "transgender tour." They tell 13 Action News they chose to protest at valley college campuses because of their tolerance towards the LGBTQ community, specifically transgender people. According to UNLV's website , the school recently adopted gender-neutral bathrooms across campus. UNLV has also consistently been ranked by U.S. News and World Reports as one of the most diverse campuses across the nation, second only to Rutgers in New Jersey. Students at UNLV say their diversity is why they chose to hold counter protests and push back against the church and their message. "When we talk about diversity, this is us," says a counter-protester, Fabian Donate. "We are the main representation of that." More photos of the counter protest at UNLV are in the photo gallery at the top of the story.